I have a favorite planter for flowers. It is a strawberry pot. I, for some reason, cannot grow strawberries, so I use it for flowers. 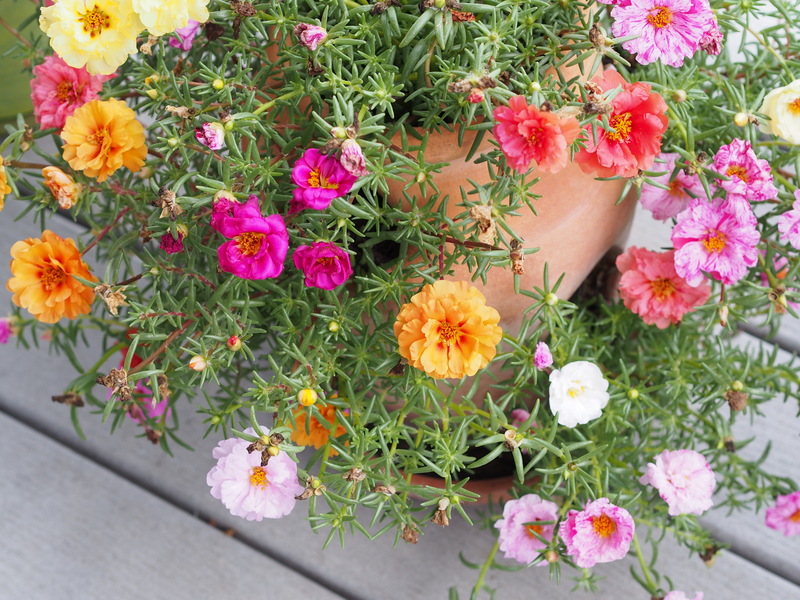 In the spring I plant it with moss rose. Now that autumn is approaching central Texas (it is still in the low 90’s everyday. ) I decided it was time to change the flowers. The moss rose was looking a bit tired, so I transplanted it to the larger garden and replanted the strawberry pot with fall flowers. I decided to go with pansies and asters. The aster will be a pink color because I picked up the wrong container at the store but I think it will be pretty and be a nice pop of color. Strawberry planter with winter flowers. One thing that I realized about the flowers that I choose is that I pick containers that have golden-yellow flowers in the mix. When I was a little girl we were traveling from Texas to Oregon to visit relatives and passed through Santa Fe, New Mexico. They had a market with people selling all kinds of things and I saw a handmade doll in a dress the color of golden maize. I remember thinking that was the prettiest color. I guess I still do.